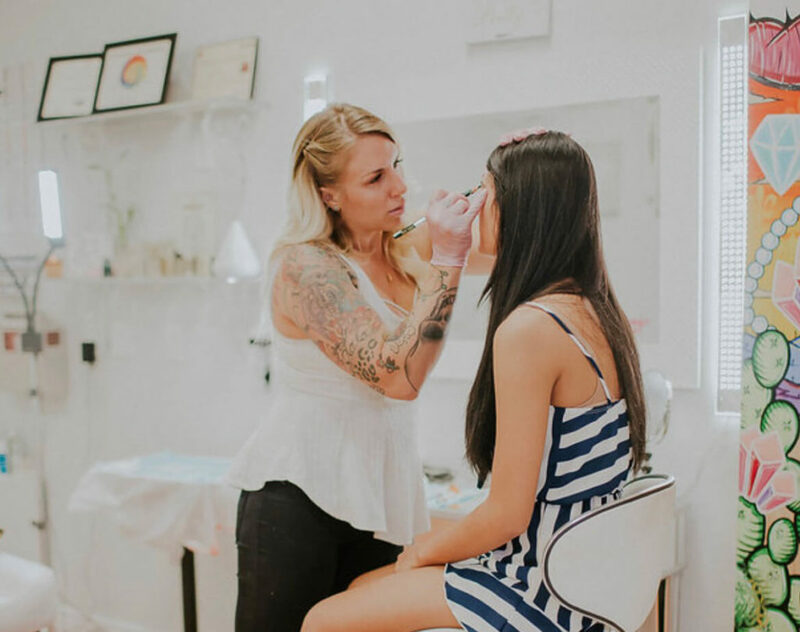 We are proudly located in Gilbert, AZ and specialize in permanent makeup and organic spray tanning. We also offer permanent makeup training. 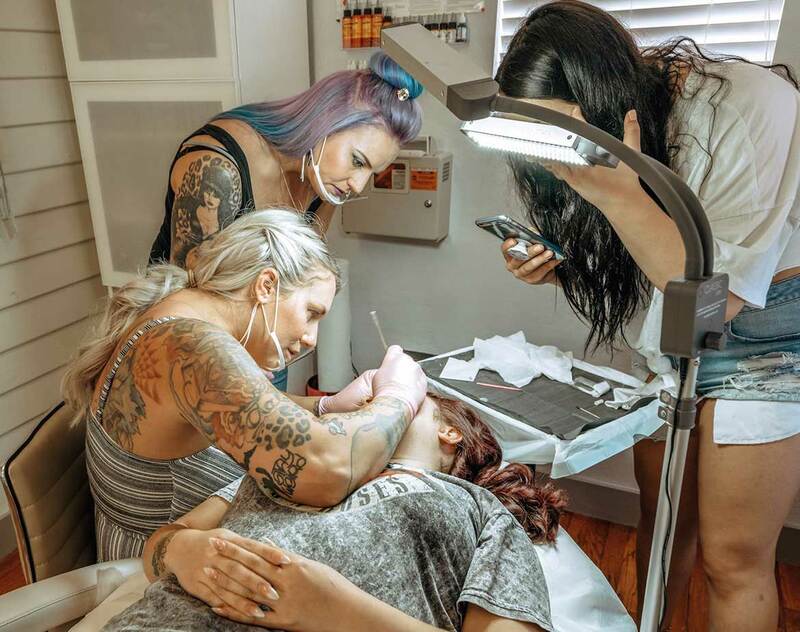 Our owner, Bre, is certified in bloodborne pathogens, specializes in color theory for cosmetic pigments, and was taught by world renowned trainers. She uses the highest quality of cosmetic pigments and her permanent cosmetics procedures have minimal discomfort. Are you ready to wake up every morning with your makeup already perfect? Bre has over 200 hours of training, and makes it a priority to do continuing education, to further her knowledge and give our clients the best! At the appointment we will do a mini consult, making sure the technique you scheduled is right for you. Come try out The Pretty House Organic Glow Spray Tan! Never be orange! We use the best of the best products in Organic Spray Tanning and have many different levels to choose from. You’ll have a natural bronze glow that lasts 7-10 days. We offer small intimate classes, (max 3 students) with the best and highest quality training you can get in AZ! Our fundamentals of Permanent Makeup training is 6 days. We also host other courses at our studio regularly. Past trainings have included Skin Needling and Areola Reconstructive Tattoos. I absolutely love The Pretty House Studio!!! Amazing quality work! Always upbeat and happy! I always leave there feeling empowered and beautiful!!! Wish we could clone her. Bre is awesome! My brows are amazing before the microblading, I had uneven brows with almost no arch. It took forever to pencil them on in the mornings. No more! I wake up with perfect brows! I’ve had complete strangers comment how jealous they are of my brows. Am thinking I may have to have her do the eye liner now. Bre did an outstanding job on my brows! I wish I had gotten it done sooner. There’s nothing better than waking up and being able to leave the house without filling in my brows. She perfectly matched the color and nailed the shape. She is truly an amazing artist! As a breast cancer survivor, Bre restored much more than my eyebrows! She is talented, professional, informative and kind. My brows look amazing and I have been told I look younger and brighter! I can’t believe how fantastic and natural my eyebrows look. I am so happy I did it. It made such a difference.